Offering you a complete choice of products which include safety valve. Our clients can avail from us Safety Valves (POP Type)that are widely used in pressure systems to control flow of gas or liquid. When the temperature or pressure within the vessel or pipeline exceeds the permissible limits, our valves automatically release liquid or gas. In addition to this, our products can be customized as per the specifications detailed by the customers. 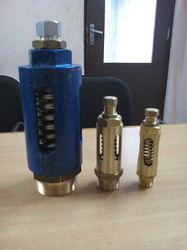 Looking for Safety Valve ?